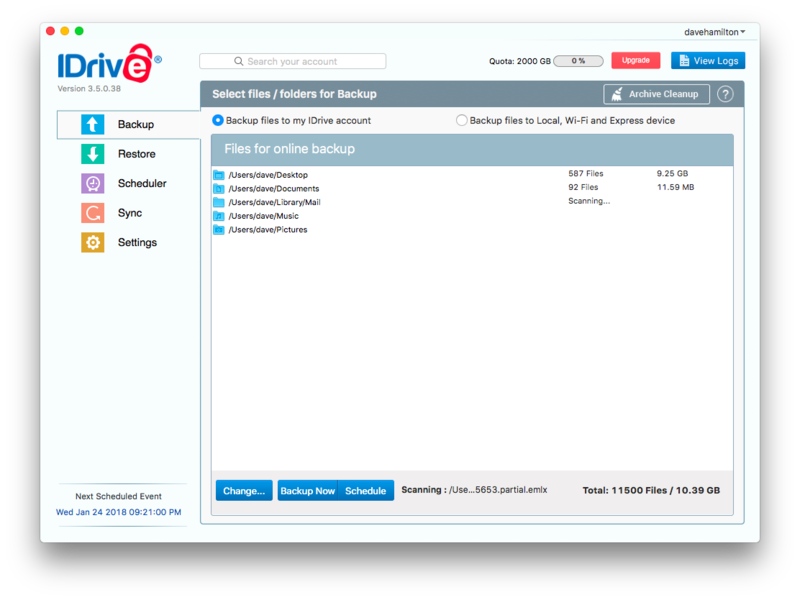 iDrive: Secure Cloud Backup for Your Mac, First Year Just $6.95 for 2TB, That's 90% Off! I am pleased to welcome IDrive as our sponsor here at TMO this week. Cloud backup is something we discuss a lot here on the site and on our Mac Geek Gab podcast, and IDrive is doing a lot of things right. First in the “doing things right” department, IDrive is giving TMO readers a special deal on their Personal Plan, which gets you 2TB of cloud backup storage for 1 year for just US$6.95 (first year only). This is a 90% discount off the regular price of $69.50 per year. With that Personal Plan, you get a ton of features to make your life easier. From multiple device backup and super fast performance to military grade 256-bit AES encryption (with optional private key) and Facebook/Instagram backup, the folks at IDrive have you covered. Personal Plan – 2 TB of cloud backup. TMO Readers get your first year for just US$6.95. Add unlimited devices to your account – PCs, Macs, iPhones, iPads, Android devices, even mapped drives. Yep, that means the data on your NAS devices can be backed up to IDrive, too. Sync files and folders between all devices, so your data is always with you. Secure 256-bit AES encryption with optional private key. This means – if you choose – you can be the only one that could ever decrypt your data. Everything is encrypted locally before it’s sent. Free IDrive Express seed backup to speed up your first upload. Yep. Free. IDrive Snapshots– Perform point-in-time recovery to protect against ransomware or other malicious software. Mobile file access/restore for iOS and Android devices. The folks at IDrive have truly thought of everything. I downloaded the app to my Mac and all-in-one, it syncs, backs up, restores, and lets you tweak your settings to match exactly what your Mac needs. IDrive automatically selects a few key folders most users will want to backup, and then you can customize/add/remove from there. I’m always on the lookout to see if apps like this are sensitive to the battery needs of mobile users and, sure enough, IDrive has a full complement of settings geared just for this. You can set it to automatically stop backups on low battery, wake and shut down the computer for backup operations, and it will even alert you if more than a set percentage of files fail to backup. This last bit ensures that you’re not having widespread backup problems, but won’t pester you if there’s one file that just couldn’t be read that day. It’s definitely worth checking out IDrive – I did, and I’m happier for it. And at $6.95 for your first year of 2TB storage, you can’t go wrong. Sign-up and download now so you can start your backups and syncing. Again, our sincere thanks to IDrive for sponsoring this week here at TMO!